My first post! I’m so happy you’re here! It’s my hope that at least one recipe from 12 Days of Christmas Recipes makes you stop and think “I NEED this”. 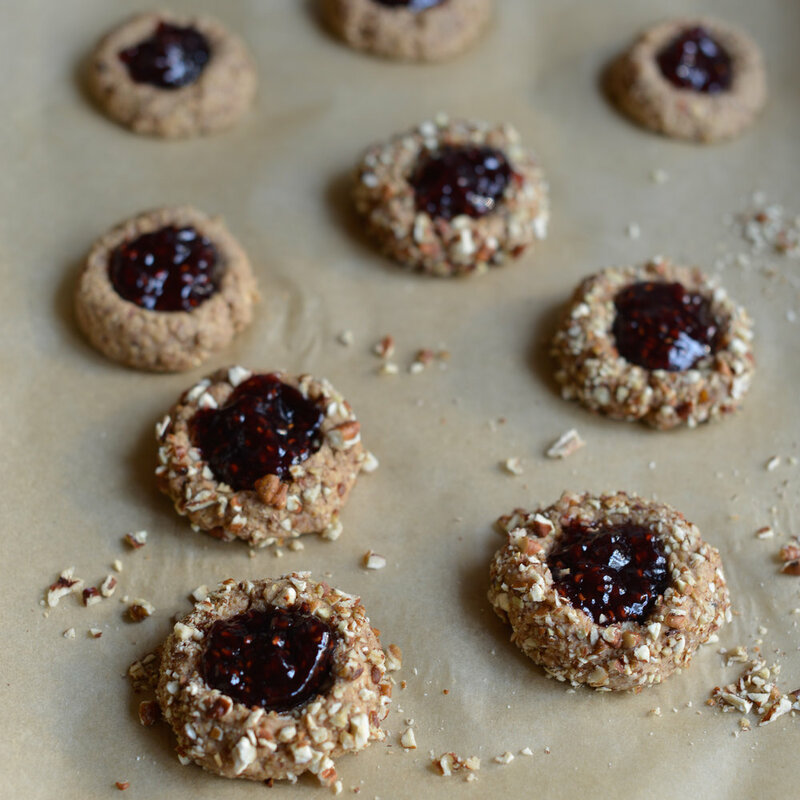 To start things off, I present to you these jam packed, healthy-ish, thumbprint cookies! If you’re here because you love jam, welcome, welcome, welcome! You’re totally also welcome if you’re gluten-free, vegan, neither, undecided, curious, etc! Scroll down for the recipe, print it if you wanna, or continue reading my thoughts on this creation of mine! Baking is a science. When I’m feeling inspired, not obligated to write down measurements, I really enjoy winging it. Throwing stuff into a bowl, guessing temperature and time, waiting for it to expand (or not expand), is a game I just named: guess and bake. Sometimes, I’ll reuse semi-burnt chocolate chip cookies for a cheesecake crust. Unfortunately, the consistency and taste will not change. Most times, I surprise myself and create something like the most perfect sweet potato cookies. I think baking is the hardest when estimating measurements. Don’t let that scare you! These Raspberry Thumbprint Cookies are densely dependable, and unlike cookies baked with refined sugar, you’ll be satisfied with just one or two. Compared to the latter, which most often lure you back to the tray time and time again. That said, there’s definitely a time and place for ooey gooey sugary desserts. And that time is coming, don’t you worry! Onto the cookies… they may be made gluten-free or gluten-full. Just don’t leave out the oat flour! When it comes to spices, cinnamon and nutmeg will get you in the Christmas mood. A flax “egg” acts as the binder. If you’ve never used flax meal in baking, don’t be scared! It’s quite simple. Just add the flax meal and water into a small bowl, stir, and let sit for a few minutes. A gelatinous texture, your egg replacer, will form. It’s pretty cool. And it contains health benefits such as fiber and omega-3 fatty acids. Flax may help lower LDL-cholesterol and total cholesterol, which in turn may lower your risk for heart disease. Super cool this powerful food can be disguised in cookie form, huh? Rolling the cookies in walnuts adds a festive border. However, if you or someone you love has a nut-allergy, please omit them! Try pumpkin seeds instead! The dates create a sweet, dense, and moist cookie. Because I used dates for this recipe I thought I’d also replace what normally constitutes oil for unsweetened applesauce. Why the heck not, right? These cookies are quite healthy, so here’s my gift to you: fill them with whatever jam you prefer. Go WILD. I do suggest raspberry, only because it’s my favorite. But maybe you like blueberry, blackberry or marmalade?! Thanks for sticking around! Enjoy the cookies and HAPPY FIRST DAY OF 12 DAYS OF CHRISTMAS RECIPES! Preheat oven to 325 degrees. Line one large cookie sheet with parchment paper. In a small bowl, make the flax egg by combining flax meal and water. Set aside for 5-10 minutes. Next, if you do not have store bought oat flour, you can make some by blending 1 ½ cups of oats into a flour-like consistency. Then in a bowl whisk together oat flour, gluten free flour, salt, cinnamon, and nutmeg. In a Cuisinart or high-speed blender, form a paste by blending medjool dates and water. In a separate bowl, mix the flax egg, vanilla extract, applesauce, and date paste. Combine the wet and dry ingredients. Mix until a dough is formed. It will be slightly sticky. Spoon dough about one tablespoon worth and roll into a ball. If you’re using walnuts or pumpkin seeds, lightly coat the dough balls and place on the prepared cookie sheet. Space the dough balls about 2 inches apart. Using your thumb, press an indentation about ¼ inch deep in the center of each cookie. Spoon about ½ teaspoon of jam into each indentation. Bake until the cookie bottoms are lightly browned, about 15 minutes. Let the cookies cool on the cookie sheet for 5 minutes and then transfer them to a wire rack to cool completely. Store the cookies in an airtight container for up to 3 days. If you give these a try, let me know what you think in the comments below and share with your friends!